This nostalgic cat loves old toys, so I made it my mission to take in the “Toys Through Time” exhibit at Liberty Hall Museum in Union. It’s a well curated, well presented slice of Jersey, and toy, history. 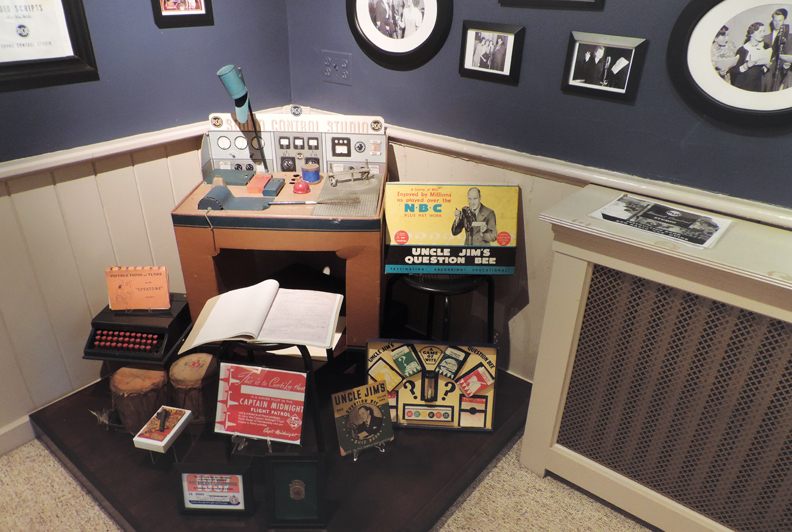 The 300 toys and games in the exhibit are the very ones the Kean family kids played with – in the very same house, too – so you almost feel like you’ve gone back in time. The multi-floor exhibit is organized by themes such as geography, war, radio, vehicles and vintage dolls. The doll section has a large, ornate doll house with a clever tableau in each room. Being a pop-culture junkie, I’m favoring character toys in the following collection of my photos. But to give a clearer idea of how the exhibit is organized, I’ll start with one of the theme sections. This is the radio section. Note the framed photos of real-life broadcasters. See also the “Uncle Jim’s Question Bee” board game and the “Captain Midnight Flight Control” certificate. Here’s a closer look at the board game. 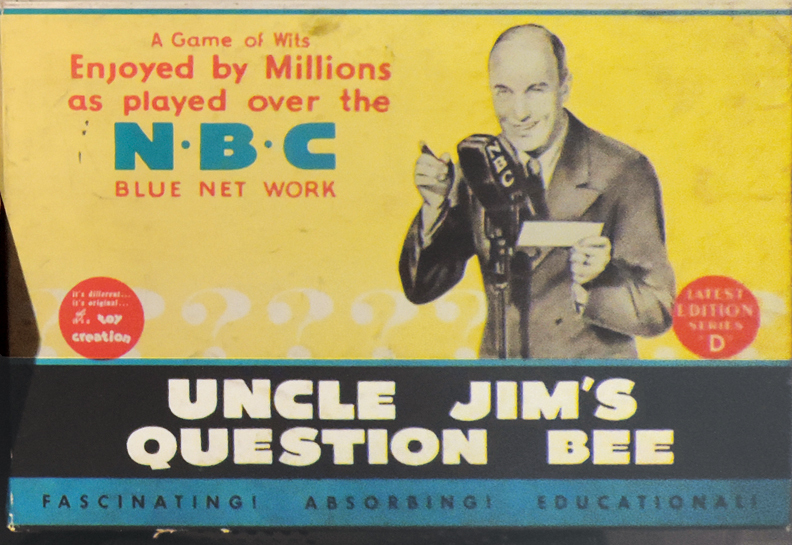 “Uncle Jim’s Question Bee” aired from 1938 to 1941. The board game was given to contestants on the radio program. It always amazes me how square children’s entertainment was back in the day. And, not for nuthin’, a little creepy. 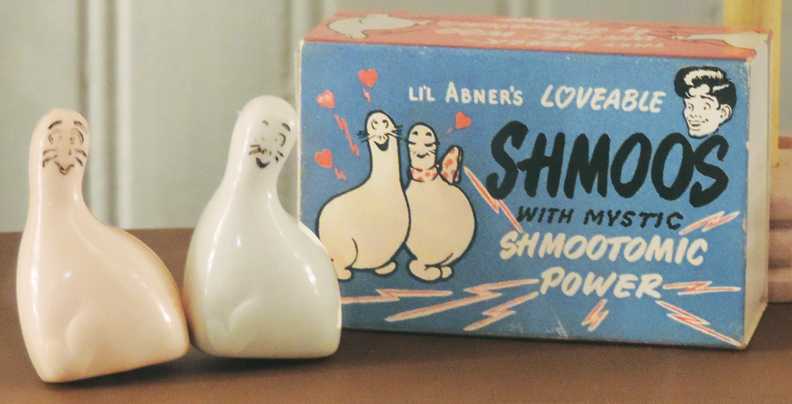 Here are Shmoo toys from 1948. 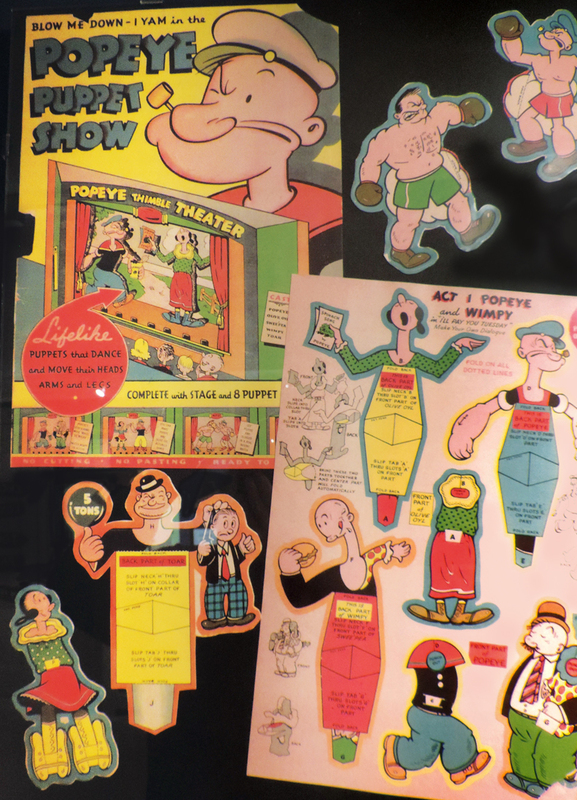 Shmoos were recurring characters in Al Capp’s classic comic strip “Li’l Abner.” The phrase on the box – “With Mystic Shootomic Power” – is telling. Three years after dropping the A-bomb, we were glibly referencing it in children’s toys? 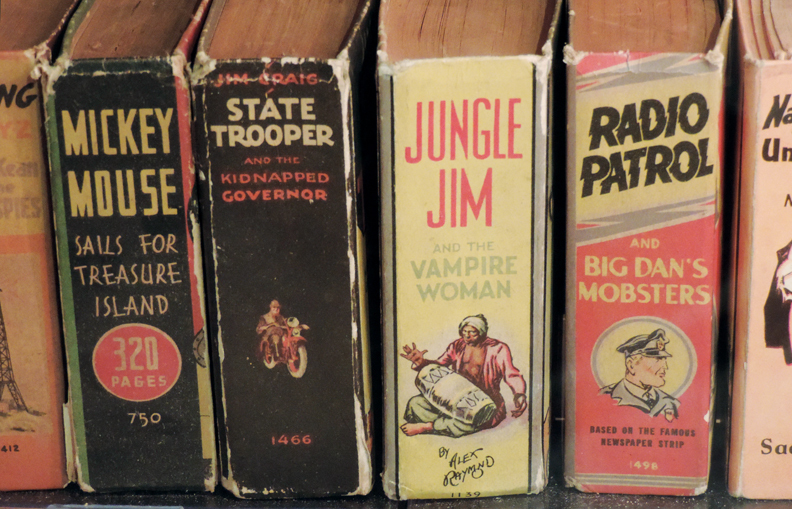 Here’s a nice collection of Little Big Books, which were published by the Whitman Publishing Co. from at least the 1930s through the 1960s. Hugh Hefner has a complete collection. I have six or seven. 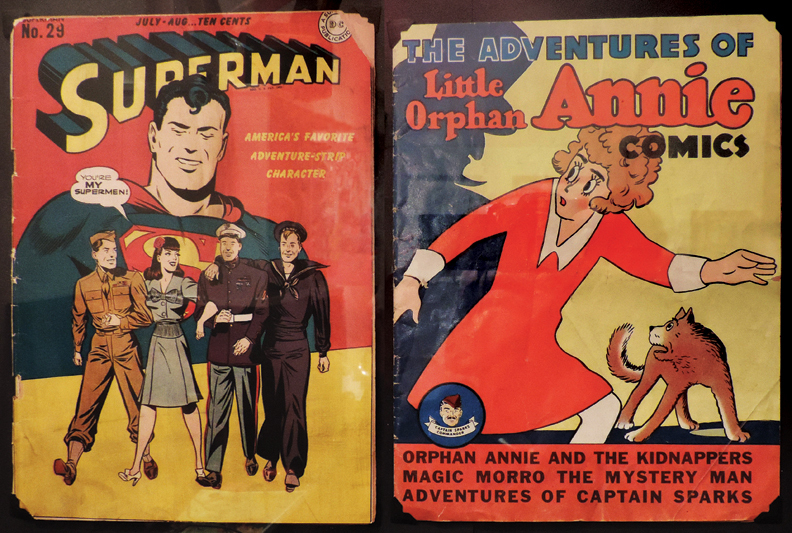 Subjects in Liberty Hall’s set include Terry and the Pirates, the Phantom, Tarzan, Mickey Mouse and Jungle Jim. Big Little Book covers for Popeye, Mickey Mouse and the Lone Ranger. 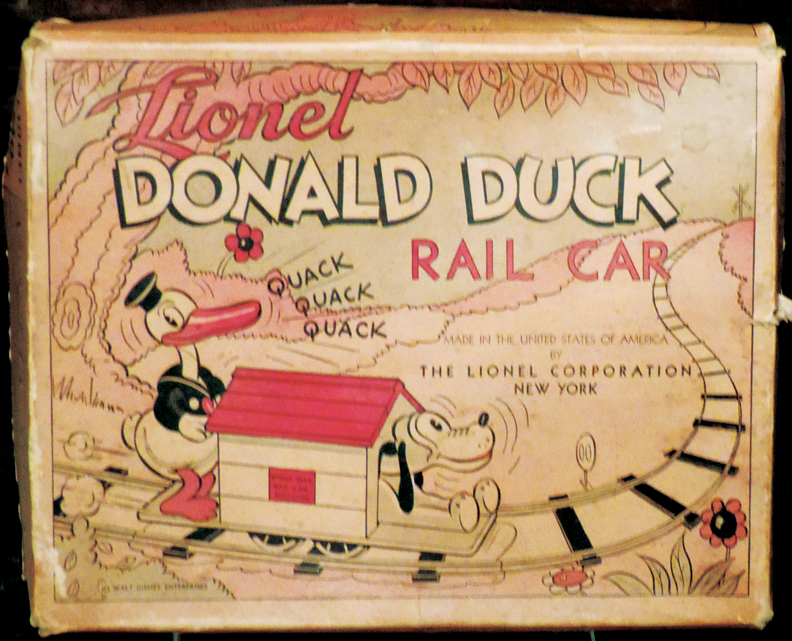 Here’s Lionel Trains’ “Donald Duck Rail Car” toy. Don’cha love that old-fashioned art style? Before they “perfected” Donald’s look? It’s like one of the old Disney shorts come to life. Here are some games from the war collection: the “Junior Air Warden Blackout Kit” (glows in the dark, so don’t play it during a real blackout) and “Bombs Away!” Yep, toy manufacturers were introducing young’uns to harsh realities early on. 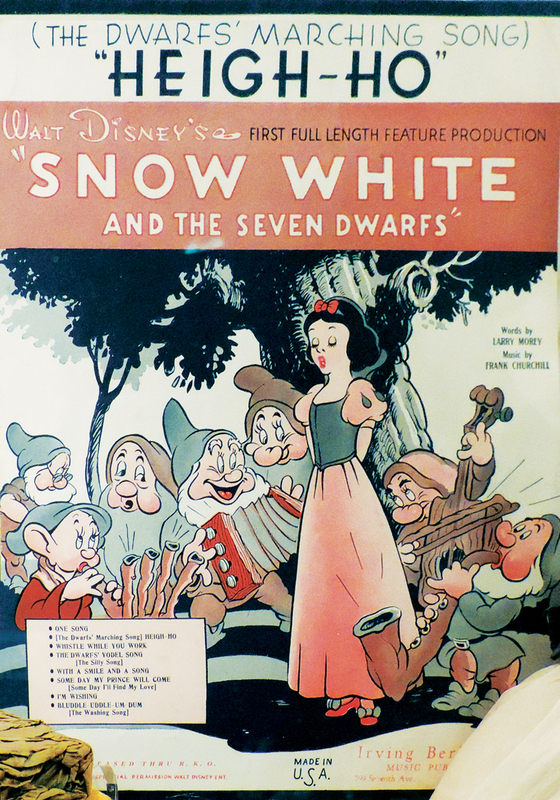 Here’s sheet music for “Snow White and the Seven Dwarves” (1939), with faithful renderings of the characters. Here’s the “Popeye Puppet Show.” It appears to still have all of the puppet figures. You’ll notice that throughout the exhibit, the original packaging has often been retained, which any toy collector will tell you is a real bonus. Through the end of the year at Liberty Hall Museum, 1003 Morris Ave., Union. Hourly tours 10 a.m.-3 p.m. Admission: $12 adults, $8 seniors and ages 3-17. Phone: 908-527-0400. More: kean.edu/libertyhall.